This article is primarily intended for those people that write on HubPages, but most of it is also applicable to anyone writing on the web. Authors writing on HubPages are no different than those anywhere else; they have their hard work stolen for reproduction elsewhere and I'm sure that there are a few of of the thousands and thousands of writers that are willing to steal as well. Unfortunate but it is a fact of life we all have to live with. This article is a departure from my normal writing; you won't find pretty pictures and you won't find Amazon products to buy. 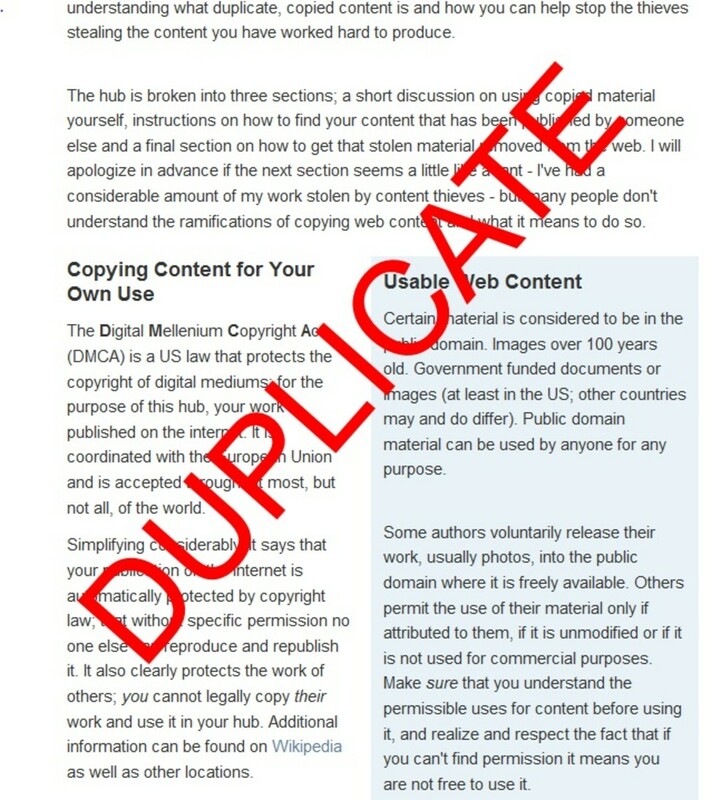 What I hope you will find is help in understanding what duplicate, copied content is and how you can help stop the thieves stealing the content you have worked hard to produce. The article is broken into three sections; a short discussion on using copied material yourself, instructions on how to find your content that has been published by someone else and a final section on how to get that stolen material removed from the web. I will apologize in advance if the next section seems a little like a rant - I've had a considerable amount of my work stolen by content thieves - but many people don't understand the ramifications of copying web content and what it means to do so. The Digital Mellenium Copyright Act (DMCA) is a US law that protects the copyright of digital mediums; for the purpose of this article, your work published on the internet. It is coordinated with the European Union and is accepted throughout most, but not all, of the world. Simplifying considerably, it says that your publication on the internet is automatically protected by copyright law; that without specific permission no one else can reproduce and republish it. It also clearly protects the work of others; you cannot legally copy their work and use it in your article. Additional information can be found on Wikipedia as well as other locations. It doesn't stop there, though. Most of us have been subjected to the idea that plagiarism is wrong in our school years and that concept very definitely applies to the theft of web content. In some ways we may be losing our ethics and this is one of those ways in that many writers see nothing wrong in stealing work that someone else did for their own gain. It is wrong, unethical, and no amount of claiming otherwise is going to change that. It is no different than someone breaking into your home and stealing your TV set or the picture you painted and hung on your wall. To steal someone else's work makes you a thief, and simply because it is on the web won't change that. Nor does it stop at text; images and photos are included in the DMCA as well as in the ethical concerns of stealing those things. HubPages has recently made somewhat of an issue of the use of stolen photos and they are entirely right in doing so. If you do not have specific permission to use a photo or image, and it's not in the public domain, don't do so. Because you can't find what you want for free and don't want to take your own photo isn't a reason to steal someone else's. 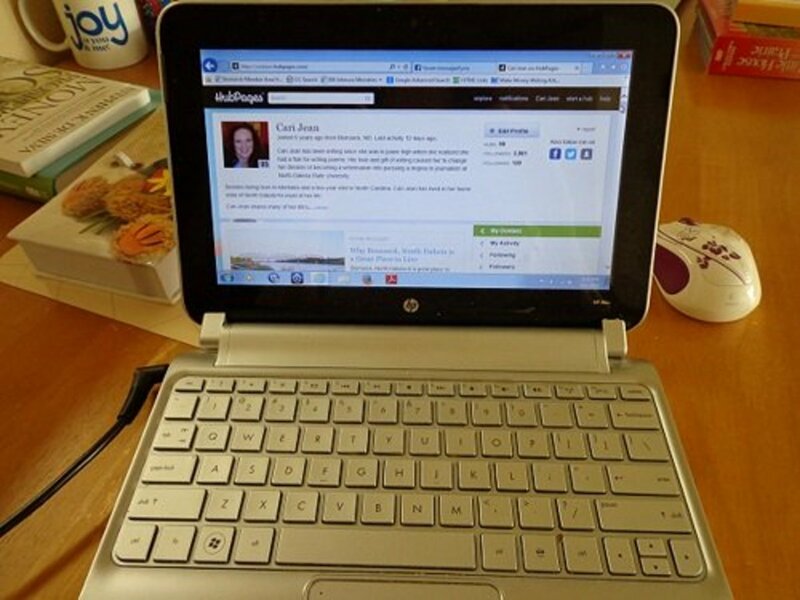 The HubPages learning center has a section on how to properly use photos on HP, although not all of that information is applicable to other sites. Shortly before writing this article I found some 30 instances where entire articles were stolen and posted elsewhere. Of those, 27 were taken by thieves for SEO purposes, to earn them money. Two were posted in forums where someone was asking a question and my article provided the answer (while crediting someone else for providing such a good answer) and one was copied by school kids building a site as a school project. Certainly the thief stealing 27 articles knew better, and the other 3 should have known better but may not have, thus this section. Please, don't steal other's content; it is neither legal nor ethical. Certain material is considered to be in the public domain. Images over 100 years old. Government funded documents or images (at least in the US; other countries may and do differ). Public domain material can be used by anyone for any purpose. Some authors voluntarily release their work, usually photos, into the public domain where it is freely available. Others permit the use of their material only if attributed to them, if it is unmodified or if it is not used for commercial purposes. Make sure that you understand the permissible uses for content before using it, and realize and respect the fact that if you can't find permission it means you are not free to use it. Relatively few images or articles are available for your use. Simply because you find an image with a Google search or on a website somewhere does not mean it can be used. Thieves that have copied your content can most definitely damage you - it is not uncommon to find the stolen work being listed above your own on search engine results. After all, many of the thieves are quite knowledgeable about writing on the web and have had considerable experience at promoting traffic. When they do they are siphoning traffic that should legitimately have gone to you and it is therefore in your best interest to find and remove that stolen content. go down a couple of paragraphs or so and copy the phrase "to clean the track out - remove any debris, small rocks or gravel, etc. 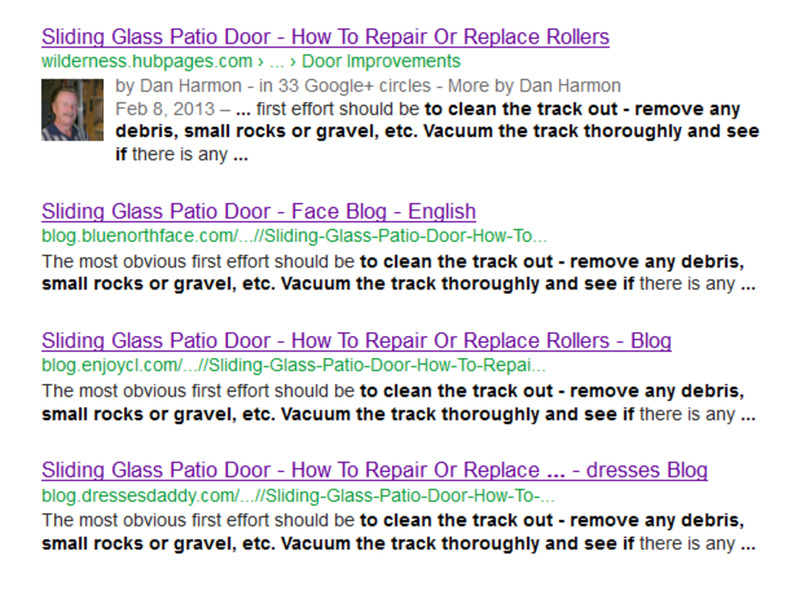 Vacuum the track thoroughly and see if" (including the quote marks) into a Google search. The search result below is what I find. The first result is my own article, and expected. The other three, however, are all something that I certainly had nothing to do with. If I open those links and take a look I find my article, or at least the phrase that I searched for. Sometimes the site is large and difficult to find my work in; by pressing Cntrl F in FireFox (other browsers may have a different "find" procedure) I can get a search box to put the same phrase in and the browser will then locate that and show it. Take a little care here and verify that a good portion of your article has been stolen, not just a sentence or two. If it is just a sentence, that is considered acceptable and you really have no rights to demand it be removed. If it's a short paragraph I will often request that it either be removed or a link to the article inserted; a backlink is probably an acceptable tradeoff to using a small portion of my article. But what if you have many articles to check? I recently checked at least one phrase, often two or more, from 175 articles and it's neither easy nor quick. There ought to be a better way, and there is. There are quite a few sites that will do the work for you, for a fee. Of course, it's that "fee" part that turns away most people, but as you grow it may well become just another business cost, the same as maintaining an internet connection or a computer. At some point you will have to either give up and allow the thieves free access to your work (and accept the drop in traffic and income that comes with it) or shell out a little cash. My decision, after this episode of tracking down thieves, is to use one of those services and pay the $10 per month or so it will cost; you will make your own decision. I do not endorse any of these sites, having tried none of them. At best, I can only say that Copyscape seems to be a popular service. You've found that your article has been stolen, now you need to take steps to protect yourself and get it removed from the net. But how? The quickest and easiest is to make a request of the "author". You might leave a comment in their comment section, for instance, or send an email to them. Unfortunately this seldom works, but it is the most "gentle" method and I will try it occasionally if I believe the publisher does not understand the rules of copyright laws and is innocent of any wrong intent. Second is to notify the owner of the site. HubPages, for example, provides a link at the bottom of each of your articles that someone can use to make a complaint about that article. Many, but not all, sites provide just such a link or information and it is usually quite effective. If not, whois is a popular site that can often be used to find a site owner and another version is whoishostingthis. If I put the URL to one of my articles into the search block at Whois, it returns the following screen (the section shown here is a ways down the total text shown). 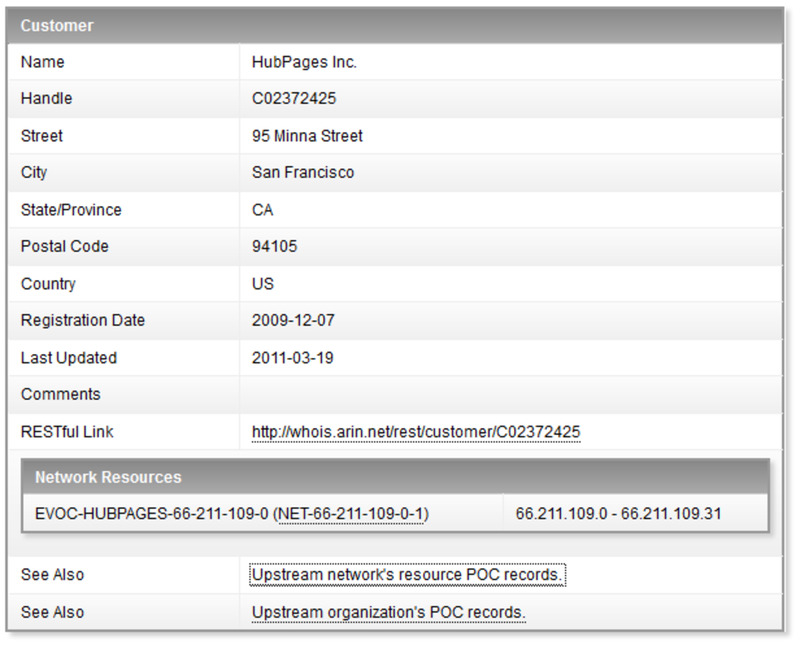 As you can see, the address, phone and email of HubPages is shown and can be used to file a DMCA claim. In the large majority of cases, particularly if the "author" of the copied material is not the site owner, this is enough. As an example, if HubPages contacts you with a DMCA claim that you have copied and stolen material in your article and you do nothing about it, HubPages will not only remove it themselves, but likely everything else you have as well. This solution is seldom welcomed by the thief and they will normally remove the material fairly quickly. If the offending content isn't removed within 48 hours I will contact the hosting site next. Not all authors or site owners check either their site or email often - if they don't care enough to do that it's time for something else. This one is a little more complex, though, as that host must be located and a simple Whois search will not provide that. To find the host, begin by visiting a site called Kloth. Insert the domain into the search block and change the query block to "ANY" (the default is something else). Make sure it is the domain - searching for a article URL will not work, but a search for HubPages.com does. The main domain is the term just before the dot com, dot org or other suffix. 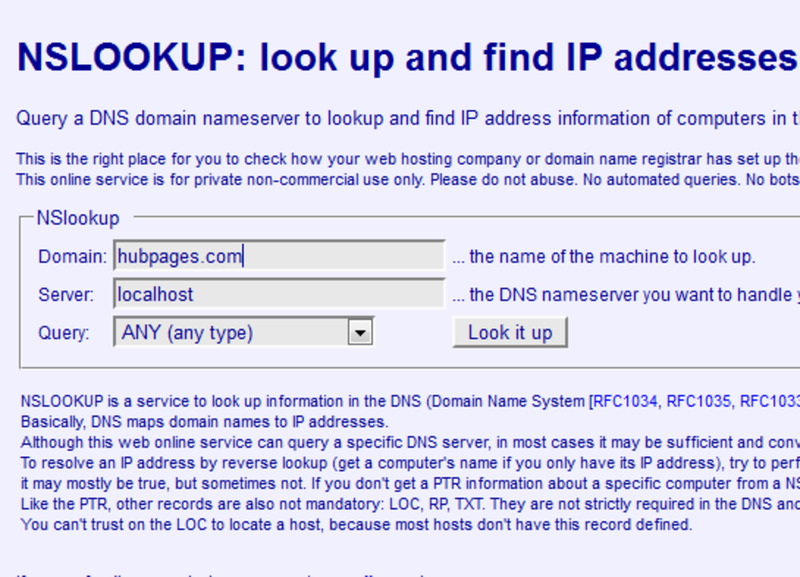 This search will return the ip address of the site, as shown below. A "host" is the company that is providing the web hosting service, that allows a person or company to make their website accessible to the internet. Although it is possible to be your own host, it is rare. Nearly all domains and sites are being "hosted" by someone else. 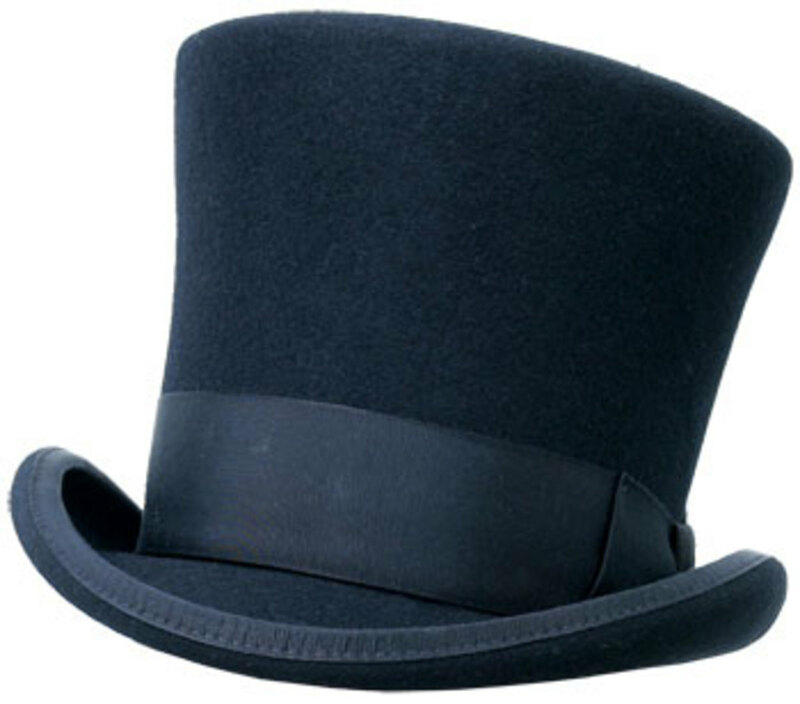 GoDaddy.com and HostGator are two of the thousands of hosts available. You can have a blog at Blogger.com by signing up with Google. It is that host, then, that actually controls the access to the internet for nearly all websites. And that can remove that access as well. Although the DMCA exempts internet service providers from liability for copyright violations of their users, those providers are nevertheless more than willing to help in removing a copied article. For the most part they will merely forward the DMCA complaint to the site owner, but the message being given is clear; "Take it down or else!". With the ip address known, the next step is to find the hosting site, and a contact to file a claim with. To accomplish this, visit Arin and input the ip address into the search box in the upper right of the screen. The results of a search for the ip address found above are shown below. 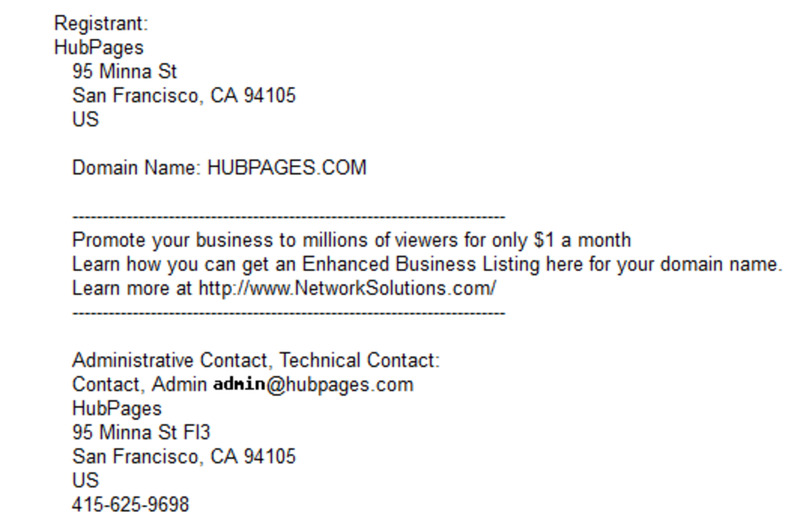 And at last we have an email address where we can send a complaint that HubPages has plagiarized our content. In the case of the thief that stole 27 of my articles and spread them all over the web I didn't even attempt to contact the person, but went straight to the host. Most hosts, given enough provocation, can and will close down the entire domain. A thief that has stolen as much material as mine did (nearly everything I saw on his many sites was copied) not only deserves but needs to be shut down, and the domain host is a great place to start that proceeding. If all of this still doesn't produce a result there still a couple of options left. If there are adsense ads on the offending site a comoplaint can be filed with Adsense. There will be a button on the ad itself to report abuse or the link here can be used. Adsense cannot remove the copied content, but the can and will pull their ads. Again, do that enough and the thief will be out of business. The other thing is to file with Google itself, with a request not to remove the content (they can't) but to remove the site from the search engine index. Again, do that enough times and the thief is out of business. Of course, you will also have to file with Bing and Yahoo. Filing a DMCA is simple. Basically you are notifying someone that the material on their site is illegal, that you are the owner of the copyright on it and are requesting that it be taken down. I'm not going to go into a lot detail here - the HubPages learning center has a tutorial on filing a DMCA - but will only provide the basic form letter that can be used. The work at issue is the text that appears at: (URL of your article that has been copied). The following page infringes on my copyrighted work: (URL of the offending page. Not domain, but actual page where the stolen material can be seen). I have a good faith belief that use of the copyrighted materials described above as allegedly infringing is not authorized by the copyright owner, its agent, or the law. I swear, under penalty of perjury, that the information in the notification is accurate and that I am the copyright owner. The items in bold must be included. You must use your legal name and you must include both the location of the original work and the copied material. Good luck and please don't use copied content in your own writing whether it be text, image or anything else. In its most general sense, a fair use is any copying of copyrighted material done for a limited and "transformative" purpose, such as to comment upon, criticize, or parody a copyrighted work. Such uses can be done without permission from the copyright owner. In other words, fair use is a defense against a claim of copyright infringement." Plagiarism well explained. Today internet is so crowded that it is very difficult to locate the theft copy of your original document. Still, if the culprits are nabbed, it is a great help. This hub has helped me in pushing for a DMCA takedown of my copied content with success. It takes more time to actually cover all the holes in one case of copied content than it takes me to write a hub (sigh). Glad I could still learn from this author and other writers who've had similar experiences. Thanks, will check them out! Alexadry, I have experience only with Copyscape (link in the hub body). I was middling pleased (they don't find everything), but it sure beats googling 2-3 snippets of text from nearly 200 hubs! They charged by the URL the last time I used them. They do not indicate hosting companies, though. I often come back to this hub because of all the helpful tips. The work is getting exhausting at times especially tracking down hosting companies. The time spent investigating, could have been spent writing. I saw you mentioned there are companies that do the work for you for like $10 a month, do you know of any good ones? Thank you! But still just a beginner, however much I enjoy it. Bob would be proud of you, your paintings are so professional looking. The scenes and the colors used in them are brilliant. I found some other interesting hubs of yours, and commented, but I didn't find the Bob Ross one. Yes it is (like the wild west). And Google is the Big Boss of the town, with no law to control it. What it has done to HP should not happen and looks (to me at least) as nothing more than a ploy to pad G's pockets. Who knows what they really do or have the capacity to do. What we do know is that they were useless in the 911 scenario, as was NORAD. That is just a fact, not an opinion. While I am on this siding, we are unprotected in the Internet. It is much like I would imagine how it was in the Wild West before the law got in control. Sweep, perhaps. But they do not control the access of billions of computers as google does. If people got a penny a word, that would be big money. Did you know that the NSA sweeps anything that is on the Internet. and I think they are more pervasive than Google. A lot of people don't write for money, and that's fine. But a lot more do, and of course HP requires a great deal of it to pay the bills that the writing site the make available generates. TANSTAAFL (There Ain't No Such Thing As A Free Lunch, Robert Heinlein). Plus, of course, even writing just to get your word out there depends on Google, and if they ding the site your hub won't get the attention it would otherwise deserve. So, to minimize that HP requires that your value added commentary be most of the hub. Thanks for the info, but my value added is the commentary, and if I get quote a public record, then I just won't do it at all. I don't write the hubs for any money. I have never even signed up to try. Sounds like what you are doing does not run afoul of copyright laws, but does violate HP requirements that all hubs must be original, and unique to the internet, work. The two are distinctly different, particularly in that attributing the work properly does not satisfy HP requirements. HP will allow "duplication" in the form of quotes, but only in limited amounts. Personally, I find that if quotes are less than 20% of the hub I will have no trouble with HP. Overall, I support this - HP is a business and exists to earn money - and a hub on "Ten Famous Quotes of Thomas Jefferson" isn't going to earn them anything. In addition, the Great Google, God of the Internet, does not approve and will ding HP as a whole for allowing it. Reducing my income as well. So include quotes as necessary, but make sure that your own commentary is a large majority of the text. But HP does indicate where the trouble is to be found when a hub has been copied - on the stats screen, click "hubs" and then "copied hubs". You will find a list of copies for each hub and where they are to be found. The list is not exhaustive by any means, but it shows why the copyright symbol is showing up. I recently had hp flag one of my hubs as duplicate, and as usual they don't give any information as to what and where they found duplicates. This particular hub had 4500 works in it. And no clue where to look. I deleted the hub and three others because it wasn't worth trying to fix it. One of the hubs was commenting on the public speeches of Bernie Sanders. So I took the direct quotes on his positions, there were several dozen of them. I put the quote and then my comment and I replicated this the entire hub. To be accurate about Bernie Sanders position I had to use them verbatim, because I could have made them inaccurate through paraphrasing them. If I want to do the same thing by using direct quotes from the US Constitution, I get the same duplicate from hp. These are not copyrighted documents, they are public records. My hubs are not using them to copy them, but to use them as examples for my opinion on them and how they are used. Paraphrasing the US Constitution is not accurate because each word counts. Also, Copyright depends on who and when was the first publisher. Well, this will surely bring a smile on those people's face who are worried about their content stealing. A good way to find out all these factors. Good work Dan. Really appreciated!! Wilderness, thanks for letting me know. I'll make sure my stuff is original and not from other websites, including my blog. I'll change it up and put it on my own words. Very useful and very thorough. Voted as such. You should be warned, Kristen, that the filters at HP do not catch all the duplicates, not by a long shot. They only do checks once in a while and even then do not catch everything. You should be checking yourself for any duplicate material. Great hub. There was a lot I didn't know. The only time I got the "duplicate" message was when I copied stuff from my book blog or another website, last fall. Now I know to keep it fresh and original for content. This is really a great article full of useful information. It is a shame that we have to be on constant guard about our work. Thank you. One of my hubs from 6 years ago was unpublished the other night as duplicated content. I was shocked, but thanks for the guide to reclaiming my work. I often go right to the site after doing everything here and post comments about the website being nothing more than a bunch of plagiarized articles. I also hit any social media sites linked to the blog and do the same. I encourage friends to also do the same thing on the sites that plagiarize my work. I spread the word hard. My goal is to discredit the site and drive down any trust with readers. I must tell you this does work. Fyi: if they are running Google Adsense I immediately report them for violating TOS and have a group of friends do the same. You have to step on these cockroaches quickly. Scumbags!! Excellent Hub by the way! Thanks for the share. I have had articles of my copied. It is frustrating. Even filing a with the DMCA does not guarantee that the person copying your material will be dealt with. Good information. Evergreen material and always useful information here, Wilderness. I'll be sharing to let some of our newest members in on this important stuff. It can be quite a while sometimes before HP rechecks your hubs - that it shows a duplicate may not mean a whole lot. Or it could still be there, whereupon other steps may need to be taken. File with Adsense or Amazon, perhaps, if the duplicate is showing ads from either. Lots of great information here! At last count, I've had content stolen from at least 35 of my hubs. If I didn't have a full time job and therefore lots of time to do what you suggest, I suppose I could stop some of this infernal copying. But, my time is much more valuable to me than the money I'd save. Later! This is such a useful hub for everyone who writes online. Many of my hubs have been copied earlier and two of my hubs are still showing, 'copied content' notification by HP. I have followed the advice to file DMCA etc. Some of them were removed, while others are still there. All this takes lot of my time and this is very frustrating as well. Thanks for sharing this wonderful article, which will always be relevant. Voted up and pinned on my 'Internet' board! Very interesting hub! I had no idea that my content was being lifted as much as it was. I found a blog where the "author" not only took chunks from my best-moving hub, but from one of my blogs as well-- in the same post. 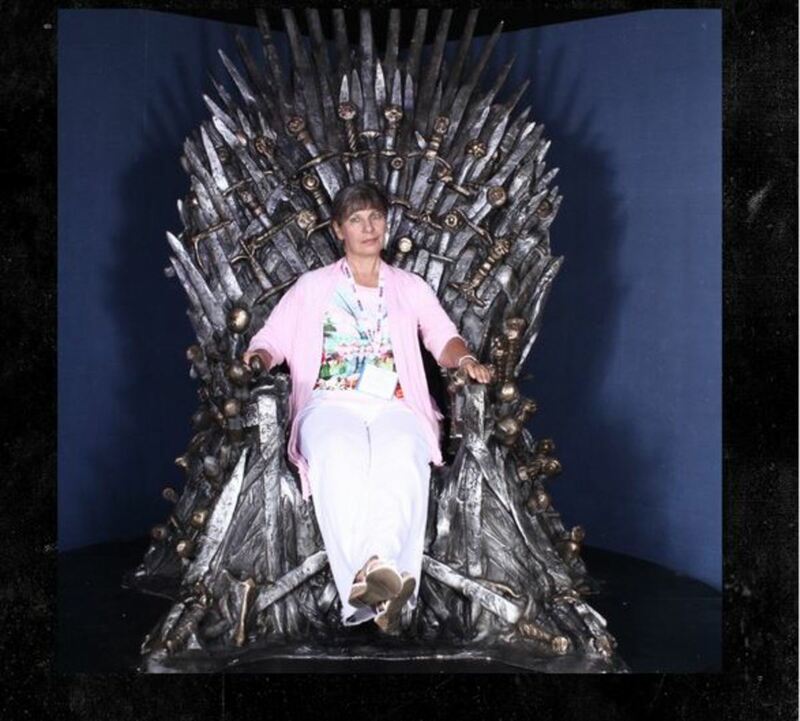 She must be a fan? lol Voted up, awesome, pinned and shared! Extremely useful hub here. So much that I've had to bookmark this. Thank you. RIPE came through for me. It took a while but and another theft, but we are back to previous status. Thanks so much for your help. You are more than welcome, TT, and I certainly hope it goes well for you. I, too, have fought the thieves and it isn't always easy. I am tearing my hair out. Five different hits on the same hub in 5 different languages. You hub may just keep our marriage together. Dearly beloved is a computer engineer, but never plays with crooks like these. He at least knows what you are talking about. Thanks. Useful explanation of the process, Wilderness. Thanks for detailing the steps in finding the IP address and user host information. This is really helpful. It varies widely with who you are filing with, but Godaddy generally takes around a week, sometimes two. Thank you for the help. I just filed a DMCA with godaddy. I saw that illmixtapes had copied more than one hub so I just included all the URLs in one DMCA. I used a combination of your template and the one in the learning center. I also included my pen name in the form. In your experience, how long does it usually take to get a response after sending a DMCA? OK - some answers: The host of illmixtapes is godaddy, and that's where I would file. Those people are scraping your hub for profit, not for fun or some other simple reason; go right for the jugular then and file with godaddy. Yes, send the DMCA to the abuse email you have for godaddy. If all your URL's are on that same site, different pages, you can try to file all of them on one form - otherwise file a separate form for each URL. It really isn't that bad if you use a form letter. You may use my template, or the one in the learning center, or one of your own. I include my pen name, as an "aka", but you must use your legal name on the form. It is a legal document and a pen name will not suffice. I put the "wilderness" in just to clarify that the author is "wilderness" and that it is I, Dan Harmon that is using the pen name. Good luck - I have had very good luck with godaddy removing stolen work. The only problem I ever have with them is when they can't find the specific page; you need to be very specific about just where the stolen work is and what it consists of. Thank you very much for this very helpful hub. I've been checking my hubs and I found this site that appears to have copied my entire hub. I did what you said and checked out both whois and whoishostingthis and both said that godaddy .com was the host of this site http: // illmixtapes .com/crispyhiphop .php?url=ceresschwarz.hubpages. com/hub/Flowers-Gifts-for-Mothers-Day. I'm still kind of confused though. 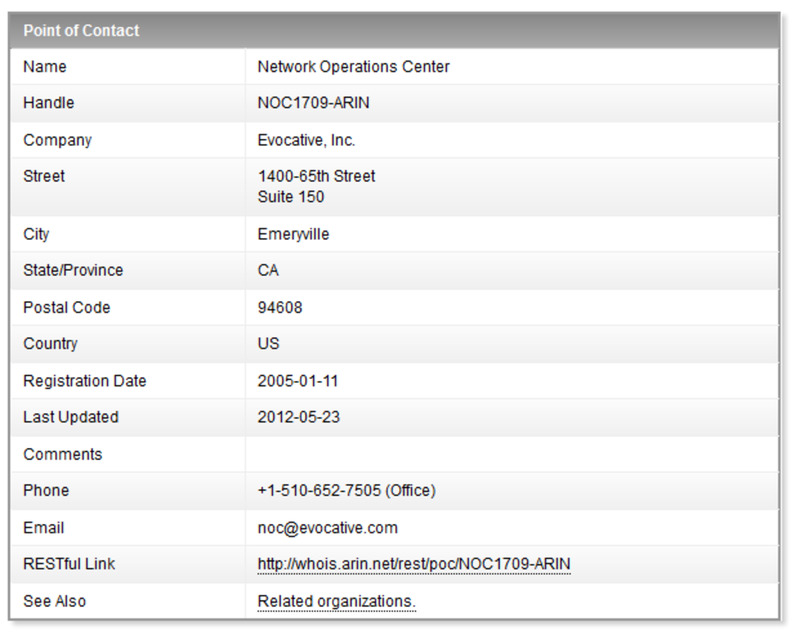 On the whois site, there are a lot of email addresses. Do I send the DMCA to the abuse contact email- abuse @ godaddy .com? Is that the right one? And if this site copied more than one hub, do I have to file separate DMCAs for each of those hubs or can I just file one DMCA and put all the URLs there? Also, just to clarify, am I allowed to use the DMCA letter template that you provided or the one that is in the HubPages learning center or am I supposed to write my own? And, should I not include my pen name on the letter? Is it really not all right to just use your pen name on the letter if one writes under a pen name or would this just be confusing? Sorry for so many questions. I'm pretty new to filing DMCAs. Thanks for the help. You are welcome, Mary. It's a small repayment for the help I've had over the years from other hubbers. And you are absolutely right - we must all protect our rights here. Let the thieves get by with it and we will all go down eventually as they steal everything we have worked so hard to build. This is an excellent resource for anyone on how to file DMCA notices. I was not too thrilled that my DMCA complaint to Google ended up on the Chilling Effects website the first time I filled out the Google form, but they did redact most of my personal info. I don't care that the website knows it was me who filed the complaint. It was my work I wanted removed, they would have figured it out anyway. We need to keep our rights as writers and the only way we can have any level of safety of those rights is to keep after these plagarists. Thank you for such a detailed hub. You provided a great service to many writers. From reading the forums I see this is a bit of a problem here! I will have to bookmark this to reference to if the need ever arises! I saw many instances where you could have made the same point with less words, so I will standby my statement that you can knock a few hundred words off of this and it will still be good. Other than that, this is good stuff and I will probably revisit it again, as I have had some of my content stolen as well. I use copyscape as well - it is just a business expense as far as I'm concerned, and one that is reasonably priced. I AM only middling pleased with it, however - it doesn't catch everything, not by a long shot. I am a user of Copyscape and the cost is reasonable. If you are only on HugPages, I would suggest just the basic service. This charges $0.05 USD per URL or long-text search and you sign up with a $10 deposit. Each search is deducted from that amount. I have lobbied for Google setting up such a service. I think it would be a money maker for Google and that it could provide a better service. I hope I'm your 1 millionth visitor! Great hub. Interesting and informative, will definitely bookmark this. Thanks for sharing. Voted up. @sid76: You're welcome, but as far as I know there is no way to insert the actual badge into HP. At best you might take a screenshot of it, convert it to a reasonable looking photo and post that. @rajan jolly: Glad you found the stolen material. Quite a few thieves don't stop at just stealing one hub; they are in it wholesale. Sounds like this fatemataher dot blogspot dot in/ is one of them. I hope you can get the entire blog taken down; google is normally pretty helpful there if you file a DMCA with them instead of the blog owner. Sorry, I had to deny your post; I absolutely refuse to give a backlink to a thief and you posted just such a link (plus, it will show up as a broken link if you are successful in getting the site removed). I was able to repeat your information without making a link of it; hopefully that will still inform other hubbers. Thanks for your helpful post; even though I deleted it the basic information is still here. Useful and important hub here. I just found 2 of my hubs copied at http://fatema-taher.blogspot.in/ after I did a search with a paragraph of mine. This blogger seems to have a large number of posts and one hubber sunasia22 also has found one hub of hers copied in its entirety by this blogger. I believe this blogger has copied other stuff too. Hmm. Looks like few more have had their work stolen sometime in the past. Thelma, alexadry, radhikasree, dashingme; hope it all turns out well in the end. And that's why this hub was written; to help out the authors of HP, some of whom have helped me a great deal. Hey, this is superb hub so far! wow, thank you for sharing this great hub! kudos wilderness. I have click the useful! Superb hub that explains everything on plagiarism. I too was a victim of those thieves who stole most of my highly paying hubs. I'm going to bookmark this as it's going to be highly useful for me in future. Up, useful and interesting. Thanks for sharing this excellent information. This is a very informative hub. I have just found a few days ago that some of my hubs are stolen or copied without my permission. Even my author name is used. I still have to file DMCA and find this article useful as I have not filed any DMCA, yet. Searching for stolen hubs is time consuming and I´m grateful to you to have written this hub. Voted up, shared and pinned. Thanks for sharing. Thanks, glenn - I worked this out in filing a large number of someone with several sites that proved hard to find. After spending the hours to do it. I thought I would document the procedures I found successful in the hopes of saving some time and effort for someone else. Return a little of what I've learned from other hubbers. Glad you found it useful; it makes the effort of writing it worth the time. This is a very trying time for many of us right now with the increased plagiarism going on. And your hub is extremely helpful. You explained extra tools I was not aware of to dig really deep and get the phone number and email of the abuse department of the top host. I was having trouble locating contact info on some foreign domains that didn't come up in a Whois search. But I was able to track them down using your method with kloth.net and arin.net. In addition, I never thought of filing a DMCA with AdSense when I see AdSense ads on the offending site. That's powerful! I have learned a lot from you. Thanks so much. Now I can finish doing all my DMCA filings. This is just what I need. I have a hub that has been copied several times and needed to get started on the DMCAs but it isn't as straightforward as usual. Now I know what to do. Thanks! Fantastic hub! I've been victim to stolen hubs too and it's no fun. It infuriates me to to end. I'll be sharing your hub and bookmarking as the last time I found one of hubs stolen it took me forever to figure out how I filed the last DMCA. Very informative hub. Several my hubs were copied by others. They totally copy without editing, for text and pictures as well. They are not creative people, filling the content instant without permission. Just "Copy and paste". Thanks to remind us about this. Voted up and success for you! It is so sad that we have to take our time in doing this because of all of the thievery of articles and also images. I have purposely not joined Pinterest, because if I am reading the TOS correctly, we lose the sole rights to our images. Yet I find my images in many places all across the web...sometimes attributed back to me and most of the time not. This is so good to know how to go about filing requests to have stolen things removed. I have filed quite a few DMCA complaints, but all of your other information is new to me. Up, useful, interesting votes and will share. I see many of our HubPage writers using Google images, etc. apparently not realizing that most of them are not authorized for free use. It is highly useful for the writers. I had found some of my articles stolen from here and from my websites, but couldn't do anything much. Now I know what to do. Thank you for writing this. Uh Oh - there are too many comments to answer, but thanks for your kind words, hubbers. Its great to see and hear that other people are having good luck with getting their own stolen material removed. It's also good to hear that this hub is of some value. I absolutely detest the thieves stealing our work and wanted to do my part in getting them shut down, something beyond protecting my own work. Some of the information here came from fellow hubbers in the forums, some of it comes from hosting sites and some from my own trial and error efforts. Putting it all together in one place just makes sense. Excellent hub. I had to file a DMCA complaint, and they immediately acted on it and had the content thief remove my work from her site. Content thievery is a major problem when you're publishing on the Internet. No wonder people keep sharing this (I have seen it on my home page at least a couple of times). It is very thorough! I am new, and doubt I have this problem yet, but I will bookmark this page so I have it handy in case I need the information. Thank you for sharing this with us. It is very handy to have, and it is not something I would be able to figure out on my own- at least not without spending a long time trying to figure it out. I bookmarked this critter. Also being FB'd and Tweeted. Superb! 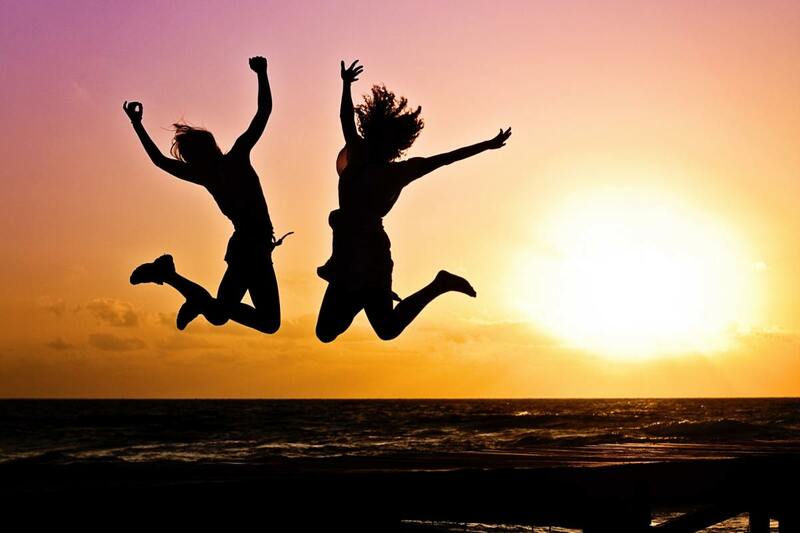 You've covered just about every angle of plagiarism and how we on hubpages can deal with it. Your links are top notch and your advice excellent. Voted up, useful, interesting and shared so others on HP can benefit from your wisdom!! I had a hub stolen, and eventually notified google. It took them a couple of weeks, but then the copied article was taken off. This is great information to have, and I'm bookmarking it. Voted up, useful - and sharing. Excellent advice, wilderness, great to have for referrence. Having recently filed DMCAs myself, it's worthwhile doing when you see the copies taken down. Why should we let people get away with stealing? Sharing this hub. Brilliant hub, packed with useful information. Thank you for sharing this. really great hub. so far i don't think i haven't had any of my articles stolen yet but then again i haven't checked. i find it very wrong when someone steal someone else's material. great information here. thanks. voted up and sharing. As a Hubber who has had work stolen, I really appreciate your advice on this subject by way of this Hub. I filed a complaint (after politly asking the thief to remove my work). When I found his work on Blogger I recognized other Hubber's works and informed them. It took about two days before this guy was removed from Blogger. These thieves will keep on copying our work. We just have to be diligent in out efforts. I have bookmarked this Hub. Thanks for writing this. Voted UP, and will certainly share for others. @PracticalMommy: Yes, it's sad, but it's also a fact of life. So far I haven't bothered with worrying about cached versions; they will disappear soon enough. A couple of weeks or so, maybe a month. It might be a good thought if I had a very seasonal hub or a current events one copied, but I have only a handful of those. @dearmommy, Angela Kane, MarleneB: You're welcome - glad it can be of some use. Very useful information. I am definitely pinning to keep as reference. Thanks for the information, your suggestions and methods of contact are very useful. As a new hubber, this is GREAT information and very valuable to me. Thanks for taking the time to write it!! Excellent explanation of what plagiarism is on the web and how to search for your own material that has been copied. It's an unfortunate part of this writing online business, to have your own work stolen and used by someone else. One thing I would add is that even if copied content is removed from a site, the cached versions can still show up in search results. Google can remove those as well, but you have to once again submit it in a form and request that it be removed. Thanks, people. We see lots of hubbers in the forums asking about how to file complaints - maybe this will answer some of the questions. This is a great and very useful hub! It's going right into my bookmarks!